NOTE: All United States Federal Bluefin Tuna regulations apply to this tournament. All boats must possess the proper state and federal permits and licenses to participate. All fish must adhere to state and federal regulations to qualify for this tournament. The Bluefin Blowout Tournament does not have a weather committee. Each Captain is responsible for decisions made due to weather. Advisories of the weather conditions will be posted and are for the protection of the participants. Decisions to fish or not to fish will be at the discretion of the captain and participants. FISH AT YOUR OWN RISK! Heaviest Fish – length per federal Bluefin Tuna regulations: Currently 73 inches CFL. Please check updated regulations on the NMFS website (https://hmspermits.noaa.gov). 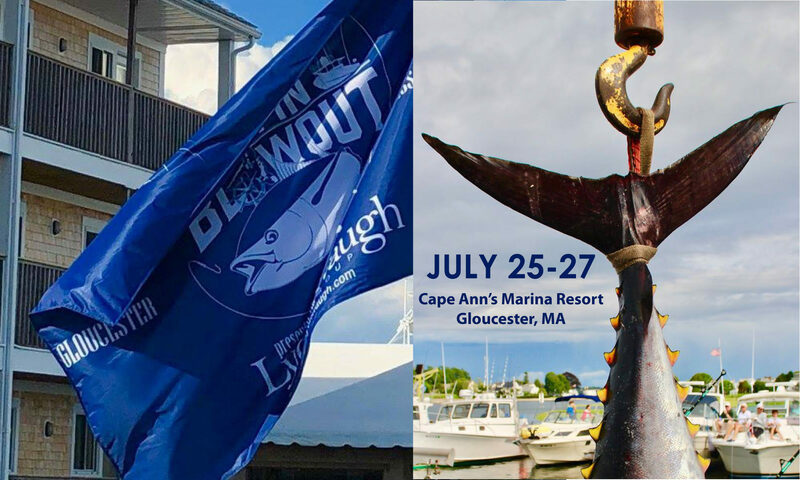 All tunas qualifying for the must be brought to the official Bluefin Blowout Tournament weigh-in station Cape Ann’s Marina Resort in Gloucester, MA. Tunas will be weighed in by the weigh master. The weigh master or a tournament member accompanying the weigh master will record the weight and then present the boat with a slip of paper with the name of the boat and the weight of the tuna. Our weigh master will be available to answer any questions on Thursday evening at the Captain’s Meeting. D. The weigh master shall inspect each fish upon arrival for adherence to the field dressing requirement. He will assist each vessel as necessary to insure uniformity, but will not delay other boats from weighing their fish. E. It shall be the responsibility of the boat to notify their dealer of arrival time, and in the event a dealer is delayed, the fish will be put back on the boat until dealer arrival, or the boat may then bring the fish to the dealers wharf. F. In the event a fish is either towed in by a small boat, or is too big for a boat to put it aboard, the weigh master will assist the boat in preparation but not create delay. G. The decision of the weigh master in adequacy of preparation, weight of fish, and adherence to these rules is final, subject to the appellate process of the tournament rules. H. After the weigh master releases the fish, any disposal must be done outside the harbor. I. The decision of the weigh master is final and cannot be appealed. All boats must have the ability to fish without any outside help. There will be no transfer of fish from one boat to another. The boat that caught the fish must bring the fish to the weigh-in station. All boats can leave from any port. Boats not berthed at Cape Ann’s Marina Resort at any time during the tournament must text or e-mail a photo of their vessel at their home port with digital date and time. The tournament VHF channel will be announced prior to and at the captain’s meeting. Fishing Hours: Although we urge all participants to reserve dockage at Cape Ann’s Marina Resort, all boats can leave from any port. Boats may leave no earlier than 10PM THURSDAY, AUGUST 2, 2018. OVERNIGHT FISHING IS PERMITTED. SEE WEIGH IN HOURS BELOW. Boats not berthed at Cape Ann’s Marina Resort at any time during the tournament must text or e-mail a photo of their vessel at their home port with digital date and time with respect to these rules. Weigh In: The Weigh-In station is open from 1:00pm-9:00pm on Friday and 1:00pm – 4:30pm-close on Saturday. Boats are deemed eligible for weigh-in on Saturday, if they have passed a committee boat by 4:30PM. All vessels returning to weigh in a qualifying fish must check in and receive confirmation by VHF radio to fellow tournament boats on tournament channel (TBD). If a vessel fails to return by designated time, its catch for that day will be disqualified. Only one Bluefin Tuna per boat may be weighed in for score per day. Committee Boats: A committee boat will be stationed at the Gloucester Harbor R “6” Buoy and the Annisquam River RN “6” Buoy will be eligible for weigh-in. You must radio the committee boat at either marker on channel (TBD) to confirm your location. Official tournament time is local GPS time. All boats entering or leaving the harbor should adhere to the “NO WAKE” speed limit. Boundaries: None. It is the responsibility of the boat to meet the weigh-in deadline. All boats must meet U.S. Coast Guard Requirements and are the sole responsibility of the boat owner. (live or dead) are permitted. Anglers may fight the fish from a rod holder and cockpit harpoons are allowed. There will be no line class or tackle limitations to this tournament. An official VHF channel (TBD) will be selected for the tournament. All fish must be called in or relayed to another boat by the boat that has landed or released the fish. We ask the help of captains with relaying of notification of fish on or fish landed to the committee boats or to the tournament committee. All fish weighed in for prize eligibility must be caught from a registered boat. This is a boat tournament and in the event of mechanical failure, prior to Thursday, Captain and Crew may request that they fish an alternative boat, but the tournament committee MUST approve the boat change. As per NMFS rules and regulations, there will be so switching of fish. Once a fish is tied off along side or hauled aboard a boat, that fish belongs to that boat. The tournament committee asks that any fish that are in contention be radioed or relayed to the committee boat. Boats that are fishing off shore are required to radio other boats to announce a fish in contention to any participants in the area. The intention is to log the fish and avoid foul play. Protests: All protests must be in writing with a $50 fee submitted to the Tournament Committee prior to the closing of the weigh-in station each day. If the protest is upheld, the $50 fee will be returned. Each team that submits a protest or if other teams submit the same protest a $50 fee will be required from each team. If the protest is upheld, all fees will be returned. Anglers and crew aboard winning boats may be subjected to a lie detector test. Boats are to respect fellow competitors, at all times. Reasonable distance should be kept from all boats fighting fish. If requested by a boat fighting a fish, other boats shall keep clear until the fight has concluded. All participants and their crews, friends, and family shall be respectful of the tournament hosts, i.e. Cape Ann’s Marina Resort as well as their staff. Captain’s Meeting. Once the tournament starts, all boats will abide by the tournament rules. Any breach of any of the above Tournament Rules will result in Disqualification. Decisions of the Tournament Committee are final. IMPORTANT: Any and all final decisions will be made by the Bluefin Blowout organizers / committee.